In 2011 at age 57, I took a sabbatical from my engineering career to re-join the Peace Corps, serving three years in Mali and Cameroon. I say “re-join” because I first served as a Peace Corps Volunteer straight out of college; in the Central Highlands of Kenya, I both built village-scale water projects and met my wife of 35 years, a fellow Volunteer teaching high school math. Why did I take a sabbatical at the “peak” of my career? Maybe it was because my wife and I had just become empty nesters. Maybe we reminisced about our youthful romance in that far-off exotic land. We often talked of serving again. What were we waiting for? Now, having returned from my latest adventure and resumed my interrupted career, I offer these personal observations to others that could, would and should take a mid-career sabbatical. 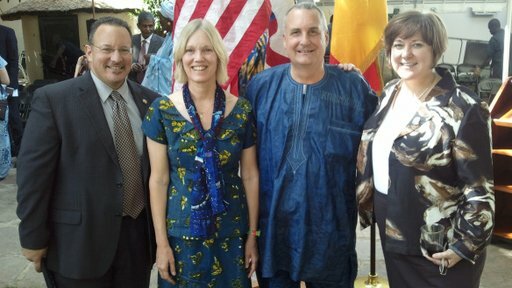 In 2011 at age 57, Bill Huffman took a sabbatical to serve as a Peace Corps Volunteer in Mali and Cameroon. 1) Instead of making a better living, I should have been making a better life. The “rat race,” “in a rut,” whatever you call it -- it’s the day-in, day-out craving for the latest and greatest fashion, gadget or shallow amusement. What was really important to me? My elementary school stories preached that clothes don’t make the man. Apparently I wasn’t listening that day. My lifelong dream was to earn an advanced engineering degree. So in 2010, I enrolled in a prestigious university’s online graduate education program. Despite sometimes-spotty Internet access, I was able to complete the coursework using cellular Internet on my laptop computer and was awarded my master’s degree before completing my Peace Corps service. It might have been easier to wait and complete the master's program while living in the U.S. But surmounting those seemingly insurmountable obstacles is a pride that I will carry to the end of my days. Preparing to leave for three years, I priced out a storage unit large enough to hold all my “stuff.” I was astonished to find that the monthly storage rent exceeded my Volunteer salary. My wife and I sorted through the “stuff” to determine what we really wanted to keep and what we could dispense with. In the end, we decided we could dispense with all of it. We wholesaled our cars to a dealer. Furniture and appliances went to a family friend. Goodwill and the Salvation Army got the household goods. A few cherished mementos ended up in the smallest storage unit available, and half of that space was shared with our daughter. How much of my labors had been wasted for decades to maintain my ‘stuff’? I thought I needed all that ‘stuff’ to maintain me; I was wrong. 3) My eyes were opened by atypical friendships. When I mobilized to Mali, I was joined by 45 other Peace Corps Volunteers, nearly all of them were younger than my grown daughter. Some of those “kids” appeared to be exactly like the ones I had forbade her to associate with at school. I figured I’d put up with their oddness for the three months of pre-service training, then settle back into my accustomed ways at my permanent post. Living conditions in rural Africa are austere by American standards; Mali could be the most difficult. In hindsight, I wouldn’t have survived that ordeal for three days, let alone three years, without the friendly camaraderie of those “kids.” Their enthusiasm and energy were simply infectious and it buoyed me through my numerous bouts of self-doubt. I quickly grew grateful for their tolerance of me and valued their unwavering support over the many months that followed. Those friendships continue today, fostered by the marvel of online social media, an addiction I acquired from them. In addition to being an accomplished engineer, I was also a successful business owner. As part of my Peace Corps service, I taught adult African students modern business controls. In return, they taught me their traditional life skills. My career had been driven to use more “stuff” to make more “stuff.” My students already excelled at making just enough, using just enough and nothing more. We in the developed world have naively rediscovered that concept and adopted it as “just in time” manufacturing and delivery, or “sustainability.” The Africans call it “life” or “survival.” It’s an insight I hope I never forget. 4) I measure my sabbatical with more than numbers. On October 30, 2011, I flew out to Peace Corps service in Mali, West Africa with one suitcase, one backpack and one heart filled with hope and promise. On March 21, 2014, I returned from my completed service with one suitcase, one backpack and one heart full of pride and joy. I endured five months of semi-desert Mali, one of the poorest countries in the world and the harshest living environment I have ever experienced. I survived the March 2012 Malian Army mutiny and battlefield rout, the subsequent coup d’état, three weeks of lockdown and eventual evacuation. I was reassigned to 22 months in Cameroon, a comparatively under-appreciated Garden of Eden. I practiced an uncommon routine of diet and exercise, jettisoning 30 pounds of body fat in the process. I am healthier now than I was 20 years ago. I was awarded a Master’s of Environmental Engineering degree by the University of Florida. I lived, worked and sojourned on the ground in five West African countries that I had previously only known as colored shapes on a wall map: Mali, Ghana, Cameroon, the Gambia and Morocco. I built up innumerable lasting friendships through chance encounters and hopefully broke down forever some of my uglier prejudices. I refocused my outlook on life and the purpose for my precious remaining time. A mid-career sabbatical could be your answer but probably seems impossible when you feel buried under life’s stresses and strains. It is not impossible. You just have to decide to do it. Bill Huffman (RPCV Kenya 1976-78, Mali 2012, Cameroon 2012-14) is a professional water engineer who met his wife Ruth, a fellow Peace Corps Volunteer, during his first PC service tour in Kenya in the 70’s. He worked for decades at a traditional American engineering and construction career, always striving to balance his life outlook by intermingling humanitarian missions in sub-Saharan Africa and Central America. His latest overseas adventure, a second three-year tour with US Peace Corps sharing his business and water development skills, concluded in 2014. Post-Peace Corps, Bill enjoys a blend of part-time work, more family time and less stuff in his semi-retirement in Florida.